(Turtlehead (Chelone glabra) - 01) We found these rare turtlehead wildflowers growing on the edge of a drainage ditch just off the side of the road. 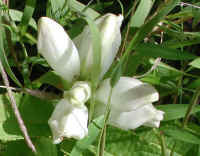 Turtleheads are usually found along the edges of lakes, rivers and streams, or in other normally wet ground areas. The literature says that they can grow to heights of 2-5 feet, but all of the ones we have found have been relatively short. These were only about a foot in height. 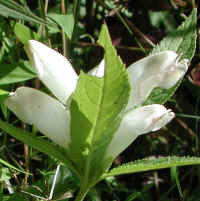 (Turtlehead (Chelone glabra) - 02) The lanceolate leaves of the turtlehead grow opposite one another and are sharply toothed. 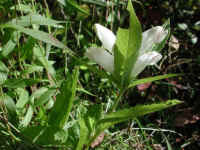 The flowers are usually about one inch in length, but may be as long as one and one-half inches. (Turtlehead (Chelone glabra) - 02a) In this photo, we get a closer look at the top of the turtlehead bloom. 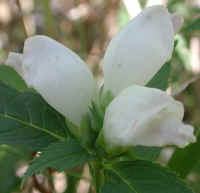 The turtlehead blooms from August to October. 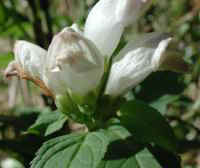 We found these in early October, and judging from the buds, it appears that it is just beginning to bloom. 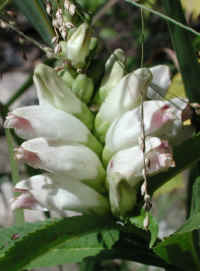 The flowers of the turtlehead form a tightly packed spike at the top of the plant. 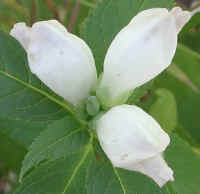 (Turtlehead (Chelone glabra) - 03) The turtlehead got its name because the corolla looks something like the head of a turtle, which is also reflected in the scientific name "chelone," which in Greek means "tortoise." 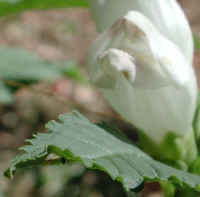 In this photo, we can also see the short stems on the leaves where they branch off from the stalk. (Turtlehead (Chelone glabra) - 04) In this photo of the turtlehead, we can see more of the beginnings of the flowering spike. (Turtlehead (Chelone glabra) - 04a) This is a semi-frontal view of a single turtlehead flower with its "open mouth" and "hairy tongue." (Turtlehead (Chelone glabra) - 05) In this close-up photo of the turtlehead flower, we can see more clearly the "hairy tongue" and the "rippled" edge of the petal at the side of the "mouth." (Turtlehead (Chelone glabra) - 06) This is another close-up side view of the "mouth" of the turtlehead. 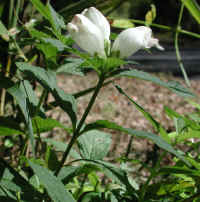 (Turtlehead (Chelone glabra) - 07) The five petals that form the two-lipped flower of the turtlehead are very hard to distinguish in the tubular construction of the corolla. 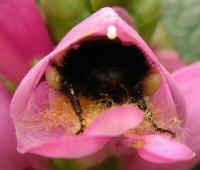 In this bee's eye view we can also see the notch in the lower part of the three-lobed lower lip, and the hairy tongue. 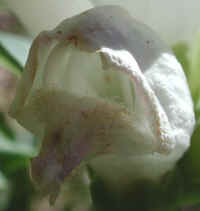 (Turtlehead (Chelone glabra) - 08) In this underside view of the turtlehead flower we can see more of the detail of the the three-lobed lower lip. (Turtlehead (Chelone glabra) - 08a) This is another bee's eye look into the open mouth of the turtlehead flower. 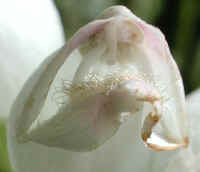 Even at this close range, it is hard to see the pistil and five stamens. (Turtlehead (Chelone glabra) - 09) In this side view of the turtlehead, we can look into the open mouth of the flower in the center of the photo, and see the pistil and five stamens. 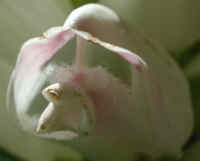 (Turtlehead (Chelone glabra) - 10) In this bee's eye view into the open mouth of the turtlehead flower, we can more clearly see the detail of the construction. 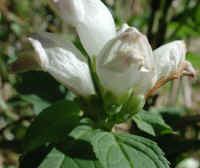 (Turtlehead (Chelone glabra) - 11) This photo gives an interesting perspective of a turtlehead leaf with a flower in the background. (Turtlehead (Chelone glabra) - 12) This side view of the turtlehead gives a good perspective of the opposite- growing leaves and the beginning of the spike formation, which in this plant will most likely be underdeveloped. 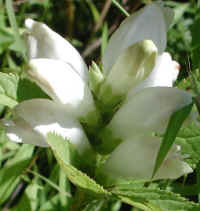 (Turtlehead (Chelone glabra) - 13) This turtlehead wildflower has a fully developed spike, and the flowers have a pinkish tint, an occasional occurrence. 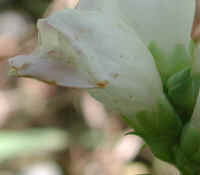 (Turtlehead (Chelone glabra) - 14) In this close-up of one of the turtlehead flowers, we can see more of the pink coloration. 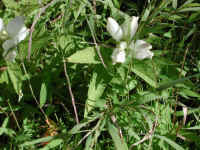 This is not the pink-flowered species, which has stalked leaves. 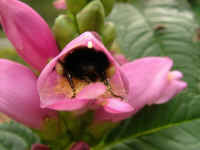 (Turtlehead (Chelone glabra) - 15) "This bumble bee was enjoying our turtle heads", said Laurie Dobbs and Craig White, who sent us this photo. 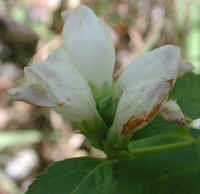 Craig White is the photographer [email protected] The pink color of this turtlehead may be a variant of the same species, or it may be a C. obliqua (we did not have enough information to make a determination). 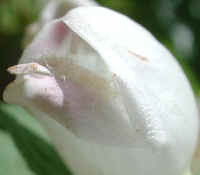 (Turtlehead (Chelone glabra) - 15a) This is a close-up look at Craig White's photo of the bee in the "mouth" of the turtlehead. 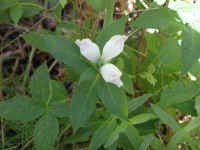 (Turtlehead (Chelone glabra) - 16) On one of our late Summer walks, we spotted a small patch of turtlehead wildflowers growing in a drainage ditch along the side of the road. 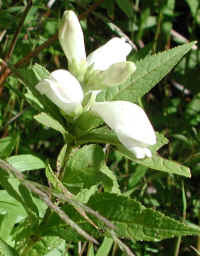 (Turtlehead (Chelone glabra) - 16a) This is a closer look at the turtlehead. 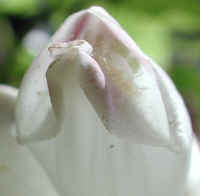 Note at the bottom of the photo that the 4 leaves just below the flower spike appear to be growing in a rosette and not just opposite one another, as they do lower down on the stem. 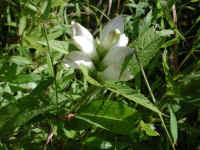 (Turtlehead (Chelone glabra) - 17) This is another look at one of the turtlehead wild flowers. 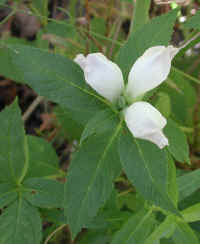 (Turtlehead (Chelone glabra) - 18) This is a top view of some of the turtlehead wildflowers growing along the side of the road. (Turtlehead (Chelone glabra) - 18a) This is a closer (top) look at one of the flower spikes of a turtlehead wildflower. (Turtlehead (Chelone glabra) - 19) This is another look at the turtlehead wildflowers that were growing along the side of the road. 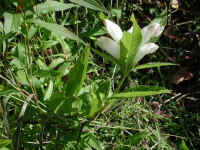 (Turtlehead (Chelone glabra) - 19a) In this view of the turtlehead wildflower, we can see the rosette of 4 leaves growing below the flower spike, and the pair of opposite growing leaves further down on the stem. 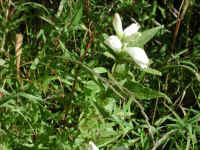 (Turtlehead (Chelone glabra) - 20) This is another photo of the turtlehead wildflowers. (Turtlehead (Chelone glabra) - 20a) This is another close up look at a turtlehead flower spike.